Mood board: Creatures of the wind by Nina Simone was the song that accompanied Rick Owens’ dreamy vision for S/S 2017. Soft knits were wrapped around shoulders and shapely cocoons enveloped upper bodies, while feathers moving to the body’s rhythm left a cloudy visual trail. 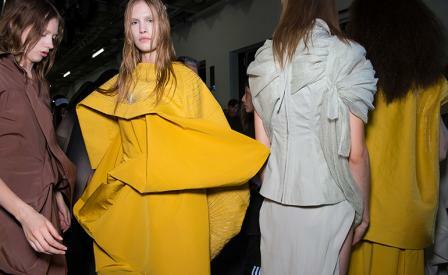 Best in show: In an otherwise neutrally-hued collection full of greys, pinks, browns and black, yellow silhouettes of undulating fabric added an overt optimism. Finishing touches: Owens elongated the toes on flat ankle boots with slouchy legs, lent an even more otherworldly air to the fairy-like models.